I should not need Pinterest to teach me how to do certain things. I am a college educated gal. Granted, I never quite made it onto the Dean’s List, but I did snag a degree on my way out the door. Beyond my impressive education, I also consider myself to be a little on the creative side. Sometimes I may need a slight nudge, but I have been known to come up with some fairly ingenious things on my own. I may not be able to name those things right now, but they’re out there…oh yes, they exist. Then Pinterest had to go and shove this in my face. 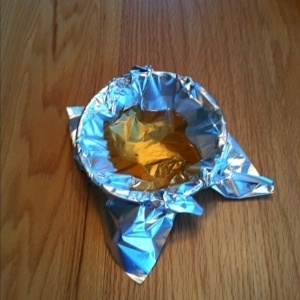 Grease from frying meat in a little tin foil lined bowl. I tried to trace back who originally posted this tip, but it’s so awesome, they apparently prefer to be anonymous because I can’t find the original – only people exclaiming how great of a tip it is. Coffee Cup or Small Bowl. Unfortunately, this has been known to sit on my counter for weeks. Did you know that some hardened grease reverts back to liquid if it sits long enough? True story. True, disgusting story. Tin Cans. I did this for a long time, but I didn’t want to save a tin can solely for this purpose. Or, I would just forget, which is more likely. Or I thought I would have one in the recycle bin that I could dig out when the time arose. Inevitably, I would make hamburgers or some ground, fatty meat the day the recycling got picked up. Plus, it felt wrong taking the tin can out of the recycling only to throw it in the trash, filled with grease. Once I tried to pour hot grease in the little plastic applesauce containers. It melted the plastic and I had grease all over the counter. I swear it had worked a previous time, but I must have let the grease cool quite a bit first. I have put it down the drain and run the hot water for a few minutes. I have only done this in rental properties. Sorry landlords. When we lived in Iowa, in the winter, I would throw the drippings over our deck into the snow. I felt I was doing the carnivorous animals in the area a good deed by making a nice little fat-popsicle for them if they wandered into our yard. And lastly, sometimes I wouldn’t even bother draining it. I may have reduced the amount of water to be added with the taco seasoning to account for the grease still in the pan. Luckily, we use ground turkey the majority of the time so I don’t think I will have significantly clogged my family’s arteries with that one. Six different strategies, none of which are good. The thing is, I use tinfoil a lot. I always have it on hand and I frequently line my baking sheets with it for the sole purpose of make clean up easier whenever I bake something. I can’t understand how I failed to make the connection to line a little bowl with it! These types of tips actually are my favorite things to happen upon on Pinterest, regardless of how blatantly obvious some of them are or how stupid it makes me feel for not being able to come up with the idea on my own. Feel free to share your favorite, slap myself on the head tips. This entry was posted in Miscellaneous Ramblings and tagged Grease collecting, obvious tips, Pinterest by Amy. Bookmark the permalink. I’ll pass that on to my husband since he would be the one that would most benefit from that tip. Sorry about the divorce drama – I can’t imagine any of that is easy.